The title picture shows a page from MAP's winter 2018 edition of its magazine Witness. And MAP? This is Medical Aid for Palestinians, a similar organization to Medicines Sans Frontieres but dedicated solely to Palestine. 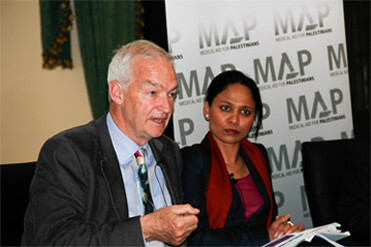 The background to MAP's work is, of course, the expulsion of Palestinians from their homeland, illegal settlements and the destruction of Palestinian homes, killings and injuries from Israeli military action, denial of access to healthcare facilities and other violations of human rights and failure to comply with UN resolutions. In the 2014 conflict alone, UNICEF and the Gaza Health Ministry reported that from 8 July to 2 August 296–315 Palestinian children died due to Israeli action, and 30% of civilian casualties were children; by 27 August, the total number of children killed had risen to 495–578, according to OCHA (UN Office for the Coordination of Humanitarian Affairs) and the Gaza Health Ministry. In March 2015, OCHA reported that 2,220 Palestinians had been killed, of whom 1,492 were civilians (551 children and 299 women). Even medics are targeted by Israeli forces - see the text below which is taken from the MAP website. The 'Life in the Shadow of the Settlements' photo/article accompanying the text is taken from MAP's Winter 2018 Witness magazine and illustrates underlying issues such as the displacement of Bedouin families. The article begins "Demolitions are a day-to-day reality for many Bedouin communities ..."
On 14 May, 34-year-old field paramedic Musa Abu-Hassanin was fatally shot while trying to evacuate wounded demonstrators east of Gaza City. Witnesses said Musa was about 200 meters from the perimeter fence at the time. On 1 June, 21-year-old medical volunteer Razan al-Najjar was fatally shot while trying to reach injured demonstrators close to Israel’s perimeter fence in Khuza’a in the south of Gaza. Witnesses said Razan approached the fence wearing a white medic’s vest with both of her arms raised to show Israeli forces about 100 meters away that she posed no threat. On 10 August, 22-year-old first responder Abdallah al-Qutati was fatally shot while providing care to a 55-year-old man who had been shot by Israeli forces east of Rafah, south Gaza. One of many short films produced by MAP in Gaza in 2018 shows the family, colleagues and friends of Abdallah al-Qutati describing the circumstances of his killing and the need for protection and accountability. These deaths only tell part of the story. Over the past decade, health workers and facilities have repeatedly been attacked or impeded by Israeli forces. In total, 39 health workers were killed and 106 injured during Israel’s 2008/9, 2012 and 2014 military offensives on Gaza. 147 primary health clinics and 80 ambulances were also damaged or destroyed. The United Kingdom, as the former holder of the League of Nations mandate for control of Palestine, has a well-known historic connection the occupied Palestinian territory and Israel. This historical link has forged strong diplomatic relations with both the Palestinian Authority and the Government of Israel. Inevitably this strong political relationship and the passion of many in the UK for Palestinian human rights means that Israel and Palestine continue to be one of the most discussed foreign policy issues in the UK. In the UK, Medical Aid for Palestinians campaigns for the UK government to ensure its bilateral and multilateral foreign policy is focused on addressing ongoing political impediments to Palestinians’ rights to health and dignity. In cooperation with the Council for Arab-British Understanding (Caabu), MAP supports delegations of British parliamentarians to travel to Israel and the occupied Palestinian territory to see for themselves the situation faced by Palestinians every day. On return, many MPs have been keen to speak out about the conditions and have called on the UK Government to act to policies harmful to Palestinian health and dignity. This anniversary coincided with the 50th year of the 1967 occupation and the 10th year of the blockade of Gaza, and highlights Britain’s historic responsibility towards Palestinian rights. These anniversaries presents a clear opportunity for the UK Government to take action to address the long-standing injustices faced by Palestinians.